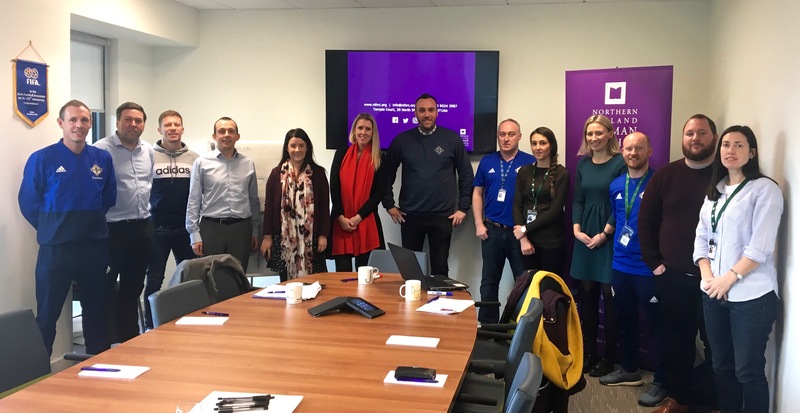 The Northern Ireland Human Rights Commission (NIHRC) has met with the Irish Football Association (IFA) to discuss the promotion and protection of human rights through sport. This coincides with the upcoming International Day for the Elimination of Violence against Women on the 25 November. training and creating time to think about how we can serve the community better. We look forward to working with the Commission more in the future”. 2. The Irish Football Association is the governing body for association football in Northern Ireland. 3. The Northern Ireland Business and Human Rights Forum is a multi-stakeholder platform which engages government, business and civil society on business and human rights. 4. 25 November is designated as the International day for the Elimination of Violence Against Women, whereby governments, international organisations as well as NGOs are invited to join together and organise activities designed to raise public awareness of the issue every year on that date. 5. The UN Convention on the Elimination of All Forms of Discrimination against Women is a human rights treaty focused on eliminating discrimination against women. It was ratified by the UK in 1986.